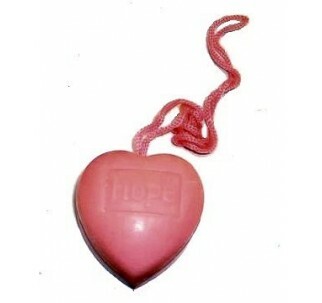 This pink heart shaped soap-on-a-rope serves as much more than just a great shower soap! It honors millions of survivors and provides hope to millions more. 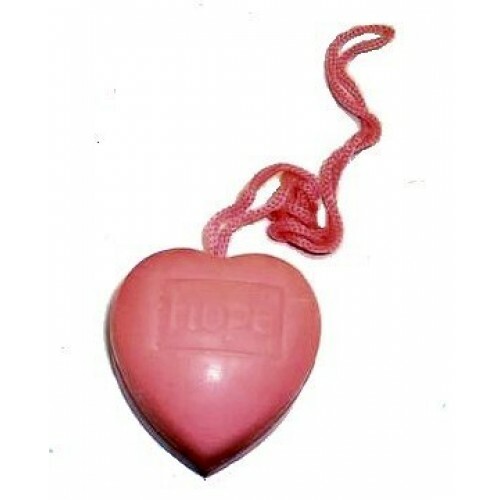 The word "hope" is proudly embossed on the front of each soap. Each piece comes indiviudally boxed with a label on the front for postage. The side-panel reads; "It is vital to our health, our children and our world that we take responsibility for our bodies. From my heart to yours, please accept this gift to hang in your shower as a reminder to be safe and continue the fight against breast cancer." Give this soap as a thoughtful gift to someone who may need some inspiration or keep it in your own shower as a reminder that we are all warriors in the battle against breast cancer. Note: A portion of each sale is contributed to the Susan G. Komen Breast Cancer Foundation.